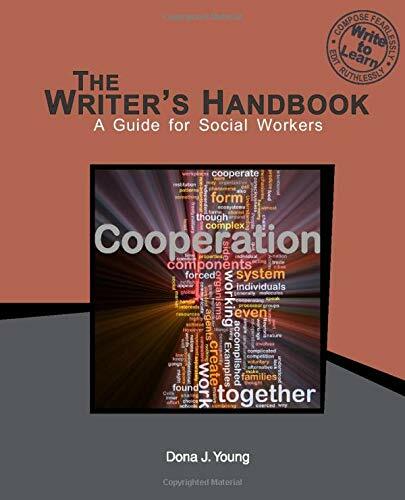 Synopsis: The Writer's Handbook: A Guide for Social Workers is a writing reference for social work majors and graduate students. Specific to social work, the text contains chapters on documenting in the field, research, and APA style citation and formatting. In addition, learners have access to full chapters on principles of grammar (such as verbs, pronouns, and parallel structure), punctuation (commas, semicolons, colons, quotation marks, and so on), and writing style (active voice, conciseness). The text is designed to help writers at all levels bring the quality of their work to higher levels by reviewing principles followed by practice. Since APA style is required for social work study, a special effort has been make to present a full chapter on APA style as well as integrate APA requirements in formatting and style throughout the text. The text is reader friendly, contains keys to all exercises at the back of the book, and gives learners access to interactive activities at the book's website. About the Author&colon; Dona Young, MA, teaches professional writing online at Indiana University Northwest. She earned an MA in education from The University of Chicago and a BA in sociology from Northern Illinois University, with minors in secondary education and business education. Young believes that writing is a powerful learning tool and that learning shapes our lives; she is also the author of the following textbooks: Business Communication and Writing (Writer’s Toolkit Publishing, 2012), Business English (McGraw-Hill Higher Education, 2008), and Foundations of Business Communication (McGraw-Hill Irwin, 2006), among others. Marshelia Harris, MSW, teaches policy, administration, and child welfare across the bachelor and master of social work programs at Indiana University Northwest. Harris received her MSW from Indiana University Northwest and BS in graphic arts management from Indiana State University. She is a licensed child welfare specialist with the state of Illinois and has several years of administrative experience in social services. Harris has developed new programs, facilitated training sessions, and managed parenting and non-parenting youth programs, case management and clinical services, and program budgets. Andrea Tamburro, Ed.D. and MSW, is a member of the Shawnee Tribe and is the Bachelor of Social Work Program Director at Indiana University on the Northwest campus. She teaches policy, research, and practice. She earned her education doctorate from Simon Fraser University in British Columbia, Canada, and her master of social work through the University of Iowa. Tamburro’s main research area is indigenous social work education; her practice areas include child welfare, mental health, domestic violence, and criminal justice.